One way we continue to keep your prices low is by utilizing our stamping facilities. 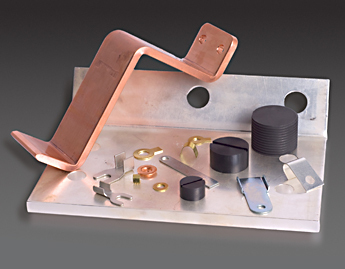 Besides contacts and shunts, our stamping equipment is also used to manufacture items such as washers, terminals, and bushings. Our Stamping Department consists of both Hydraulic and Mechanical Presses. Whether it is a quantity of one or one million, we will supply a competitive quote and fast delivery. Please call us at 800–310–5999 or email us for pricing, availability or questions you need answered!